SANTA CLARA, CA--(Marketwire - Nov 26, 2012) - Leading home automation hardware developer Aeon Labs today introduced the 2nd edition of its Micro Smart Switch, an in-wall Z-Wave power controller. 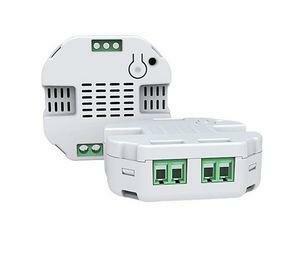 Designed for both retrofit and new-build home automation, Micro Smart Switch allows for any existing wall switch to be converted into a fully-featured Z-Wave wall switch. Uniquely designed, the new-generation Micro Smart Switch has been crafted to invisibly install within a building's walls and powers both the full automation and control of appliances and lighting. That invisible installation is another step in Aeon Labs' quest to design and develop the perfect hardware for the perfect home automation solution. Aeon Labs' view of home automation is both unique and simple: perfect home automation is invisible -- you don't see it, but you feel all of its advantages. In Micro Smart Switch (2nd edition) those advantages are numerous, offering many new technologies and refinements over the first edition. Within a device that is only slightly bigger than a few stacked coins, home and office owners will benefit from the latest stable Z-Wave technology, manual and wireless automation and control, a redesigned and fully optimized antenna, along with full energy consumption monitoring. Designed to cater to worldwide standards and needs, Micro Smart Switch (2nd edition) is able to create Z-Wave powered switches with the wall switch designs of Asia, Australia, Europe, New Zealand, South and North America and the United Kingdom. Micro Smart Switch (2nd edition) is the first product to be released from Aeon Labs' 2nd edition range of Z-Wave hardware. In early September 2012, Aeon Labs announced that it was developing 20 new Z-Wave products scheduled for release across the remainder of 2012 and into 2013. Across a selection of lifestyle, energy management and safety focused offerings, Aeon Labs' forthcoming Z-Wave products have been developed with the company's 6 years of expertise in Z-Wave research, development and manufacturing. All of Aeon Labs' new products will reflect the changing nature of how each of us lives, and wants to live, within the home and office spaces in which we spend most of our time. About Aeon Labs: Aeon Labs is a leading developer and manufacturer of wireless home technology which complements the "smart home." Our focus is to save energy, protect the home, assist the elderly and infirm, and ultimately improve the pleasure we derive from our homes through ambient and lifestyle technologies. Our products and services enable the interconnectivity of devices for home, office and hospitality control and automation. Specifically providing gateway hardware platforms, remote controllers, sensors, switches and dimmers, Aeon Labs was founded in 2006 and is headquartered in Silicon Valley, California. Our US team is complemented by offices in London and Hong Kong, along with our manufacturing facilities in China. Aeon Labs' world-class experience brings experts from all fields in developing consumer electronics for tomorrow's customer. Our philosophy holds true to our commitment to excellence in quality while working closely with our partners to bring to market intuitive system-solutions with the end-user in mind.